After attacking Devil’s Reef in 1928, the U.S. government rounded up the people of Innsmouth and took them to the desert, far from their ocean, their Deep One ancestors, and their sleeping god Cthulhu. Only Aphra and Caleb Marsh survived the camps, and they emerged without a past or a future. The government that stole Aphra's life now needs her help. Aphra must return to the ruins of her home, gather scraps of her stolen history, and assemble a new family to face the darkness of human nature. The feeling of it was a little too cozy. I wish there had been more sense of how alien Aphra et al ere to the human characters and how allying with them was a significant step for Charlie and the other human characters. Put Aphra in the middle of the expectations of her human friends and those of her Deep One ancestors. Underline the risk and the sacrifice when someone says goodbye to their "normal" life and takes up with the various Powers that fill the world. As it is, there is not really any sacrifice at all, and that makes me kind of sad. Don't get me wrong; I'll read the next one, but I wish the stakes were higher. I dunno, I think the coziness was something I really liked about it-- that the only actual monsters in Aphra's world are the people (and everyone counts as 'people') who choose to be monstrous. That's the thing that subverts Lovecraft the most, I thought. I liked the book, but the plot itself was not terribly engaging. I hope now that there's a bunch of adorably quirky characters set up, Emrys can do more things with them. I'm particularly stoked about the Cthonians, because we've seen the Deep Ones quite a bit in pop culture so far and the few details we get about them in Winter Tide seem to veer from the mythos lore. Like I said in the other thread, I liked this book but felt it focused too much on the world building at the expense of plot or characters. There was something very RPGish to me when it seemed each supporting character was assigned a character class/splat/team and then they spent a bunch of time explaining said class (not characters, but class - character development came in terms of how they were acting within their role) only to suddenly remember that something had to happen so they rushed to the end. Basically, the book could have either been shorter or longer. As is, there were times it felt truncated while at others stretched out. Part of “cozy” is that Emrys’s world feels really human-scaled, with none of Lovecraft’s vastness. As I said before, I think Emrys is really more of an anti-Lumley, another author with race and gender problems, but one who managed to make Lovecraft’s ideas weirdly mundane. We get a bit awe dear and awe at the alien with the Yithian, but, by the end of the book that’s been reduced to “it was kind of a jerk,” which was unfortunate. It might be my initial disappointment was more due to high expectations than low execution; Winter Tide doesn’t have anywhere the punch of The Ballad of Black Tom, but maybe the fault was my expecting that. 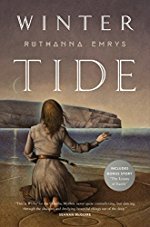 I wouldn't say I was disappointed but I was underwhelmed at the resolution the novel, given how strong the characters and their private lives were (the Innsmouthian/Deep One ritual of giving one tears to the sea was particularly beautiful). Somebody over on the thread on The Blue that inspired me to make this post said something (I think) to the effect that they felt like Emrys sacrificed a good ending to a novel in order to have strong start to a series, and I couldn't agree with that more. I want to learn more about Deep One (and now Chthonian) culture but I feel like the Russian Body Swapping plot was just a McGuffin to introduce us to Aphra's gang of eldritch adventurers.